Growing organic vegetables just about anywhere – from containers to edible walls, from raised beds to rooftops, from community gardens to neglected pavements. Planting and maintaining a space-efficient urban orchard. Converting an existing lawn or tennis court into an instant edible oasis. Keeping urban bees, hens and aquaponic tanks. Harvesting rainwater and recycling grey water. Introducing solar power into your home. Her best-selling Jane’s Delicious Garden has led to a vegetable revolution in South Africa, with thousands of home growers now following in her green footsteps. Her second book, Jane’s Delicious Kitchen, is a collection of delicious recipes for making the most of seasonal abundance. 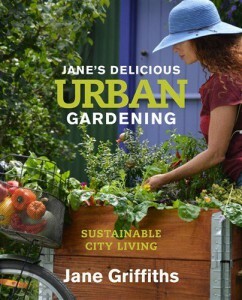 Jane’s Delicious Herbs, her third book, covers everything you need to know about growing and using over 70 different herbs. Her books have sold more than thirty thousand copies and continue to be an inspiration for thousands of South Africans. 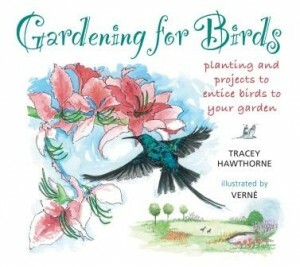 This is a charming yet practical guide to planning and designing gardens with a view to attracting birds. It’s a companion to the very successful Cooking for Birds, also beautifully illustrated by Verné. The author caters for garden situations across the country, and includes advice on planning very small gardens and even planting on balconies. Specific ‘habitats’ are recommended, to attract the widest variety of birds – an open area, wetland, canopy section and wild zone. For each, there’s a list of suggested plants, from ground covers to shrubs, creepers and trees. There are also sections on planting for birds with particular diets: nectar, seeds, fruit, insects and even meat. Beautifully presented, with simple text and delightful illustrations, this is an excellent perennial gift. Tracey Hawthorne, a freelance writer and editor, has written for magazines and journals on a wide variety of subjects. She has authored, contributed to and edited many books, both fiction and non-fiction, given workshops on editing, and tutored aspiring writers. Verné Jordaan studied in Bloemfontein before teaching graphic design at high-school level. 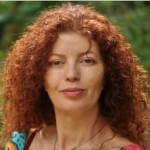 She has exhibited paintings in South Africa and abroad, and works freelance for magazines, schools and publishers.